When I moved to a new neighborhood last year, my closest coffee shop turned out to be the Manhattan location of a two-store chainlet called Café Grumpy. To my untrained eye, Café Grumpy seemed a typical coffee shop, but I soon discovered it was famous in the coffee world for two reasons: 1. The shop owned two of only 250 Clover coffee makers then in existence. And 2. Starbucks CEO Howard Schultz had seen a long line at my Café Grumpy, walked in to the shop, and later declared the coffee made by the Clover to be "the best cup of brewed coffee I have ever tasted." The Clover is a gorgeous stainless-steel device about the size of a microwave that makes just one cup of coffee at a time. It requires a special electrical outlet and more training than a nuclear sub to operate, but it produces coffee that tastes rich and true to the bean without acquiring the over-roasted flavor of most Starbucks coffee or the under-brewed flavor of what comes from most home drip machines. The downside: Clovers cost $11,000  or at least they used to. Starbucks ended up buying the company that developed the Clover  which can no longer sell the machines to anyone else  and is rolling out single-cup Clover brews in an attempt to revive the mega-chain's slowing business. 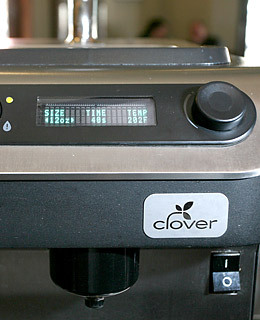 You can buy Clover coffee at Starbucks locations in Boston, San Francisco and Seattle. Or at the Café Grumpy in my neighborhood.